The south-western part of the island has a huge hole right through it (hence Cook's play on Brett's first name - piercy). This is now called "The Hole in the Rock" and is the iconic feature of the Bay of Islands whenever you see it advertised or shown on television. The island is called Motukokako Island by the Maori. From the boat ramp at Te Uenga it is about 20 minutes in a very fast boat (say 30 or more for most) to this location. There are a number of excellent dive sites here, probably more than those that are regularly dived by the local dive operations. 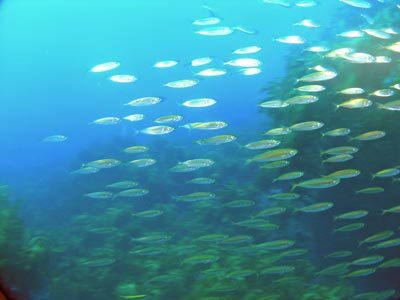 Just over two kilometres south-west of Cape Brett is a small bommie that sits about 20 metres off a small point. To the south-west of this is a small bay. 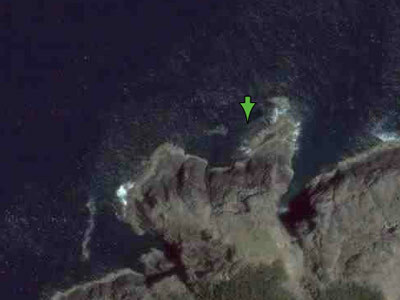 The location is GPS S35° 10' 47.5" W174° 18' 36.9" (using WGS84 as a datum). Anchor near the GPS mark and close to the gap between the point and the bommie. 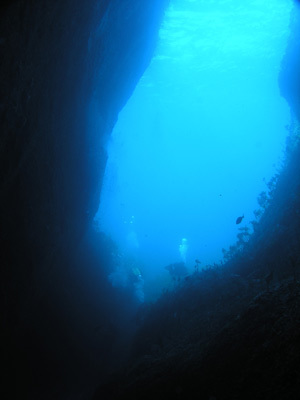 The main features of this dive are a tunnel (Big Eye Lair) which runs basically east-west under the gap between the point and island and a cave (Sonic Boom Cave) which runs back into the mainland in the south-western corner of the bay. 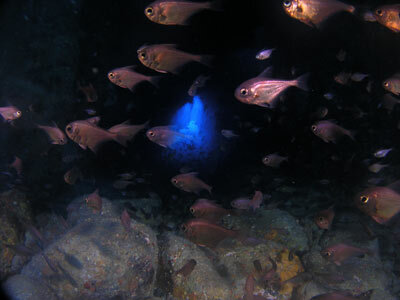 Once anchored at the GPS spot, descend to the bottom at 24 metres. You should be in or near a small sandy gutter that runs east or perhaps east-south-east. The gutter is perhaps 1.5 to 2 metres wide and about 1 to 1.5 metres deep, with kelp covering the rocks either side. Follow this to the east and within about 30 metres the gutter will turn more to the east. Ahead there are a couple of large boulders and once you go over them (21 metre) you will see a dark shape ahead. This is Big Eye Lair. At first, the dark shape appears only to be a small cave, but once you move forward a bit you can see a glow coming from the other end. It is indeed a tunnel, leading right though the ridge that connects the bommie to the point. The depth drops a little to about 22 metres inside the tunnel. The name of the site comes, of course, from the hundreds of big eyes which inhabit it. The floor of the tunnel is made from large and small pebbles, with some larger boulders as well. It is about 35 metres through the tunnel. The tunnel is about five metres wide and five metres high. At the other end of the tunnel the gutter restarts and continues east. Follow this for about 30 metres and you can then circle back to the right over the reef (kelp covered) and behind a higher rock till you return to the gutter near the tunnel entrance. Return back through the tunnel and follow the gutter till you are back near the anchor. This should have taken about 25 minutes. From here, you can explore the other main feature of the site, a large crack and cave that extends back under the rock platform. 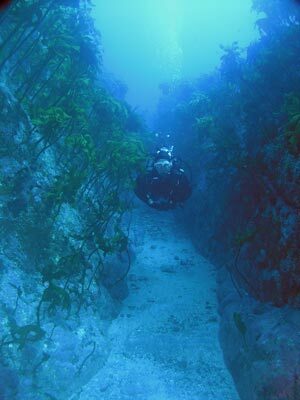 Head to the south-west and you will hit the wall below the rock platform. The depth will have decreased to about 15 metres. Once you hit the wall, follow it to the west or south (depending on where you hit it) and in the corner you will see the opening to Sonic Boom Cave. This cave starts in about 15 metres and is very high and angled to the left as you enter. It is fairly narrow, perhaps three to four metres. The cave appears to go back a long way. I only went in about 50 metres as we were getting low on air by this time. As you can imagine from the name, the cave makes a lot of noise, with the occasional "sonic boom" as the wave action compresses air pockets. Some of these feel like a light punch to the solar plexus. 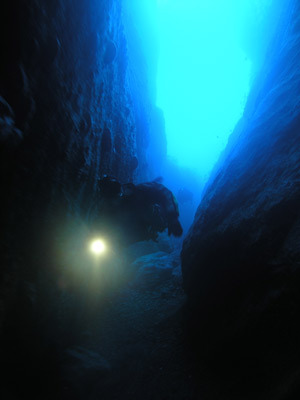 The depth comes up to at least 11 metres. Head back out of the cave and north-east and eventually you will come back to the area near the anchor. As this is 24 metres, it is best to head across to the anchor from shallow once you see it. 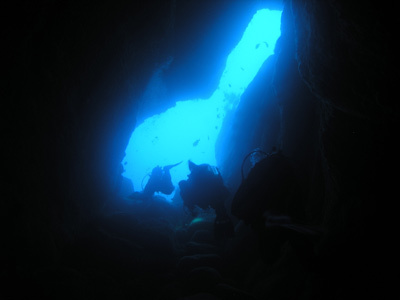 This is an excellent dive, with a brilliant tunnel and cave as well as great fishlife. We saw lots of snapper, kingfish, two spot demoiselles and various species of leatherjacket and moki (morwong). Visibility is about 30 metres and in March the temperature was 22°C.